Aksel Bender Madsen completed his cabinetmaker training in 1936 and subsequently studied furniture at the Royal Danish Academy of Fine Arts, graduation in 1940. He worked for leading Danish designers Kaare Klint and Arne Jacobsen from 1940 to 1943 and then at the architecture office of Danish Consumers Cooperative Society from 1943 to 1950. 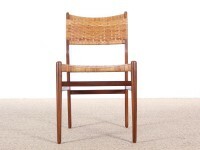 From 1946 to 1954, Bender Madsen taught furniture courses at the Royal Danish Academy of Fine Arts, serving as the Academy’s Principal from 1950 to 1954. From 1954 until his retirement, he worked for the City Architect Directorate where, among other projects, he helped design interiors for municipal institutions in the City of Copenhagen. He designed and furnished the interiors of such buildings as the Copenhagen Main Library, Thorvaldsen Museum, Nikolai Church, and Copenhagen Town Hall. Benden Madsen exhibited furniture at the Copenhagen Cabinetmakers’ Guild Furniture Exhibition together with various cabinetmakers from 1943 onwards. 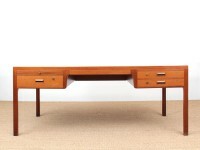 Danish mid-century modern free standing desk by Aksel Bender Madsen & Ejner Larsen for Willy Beck.